Lois Lane finds Lex Luthor's recently fired personal assistant Otis at a Metropolis watering hole. 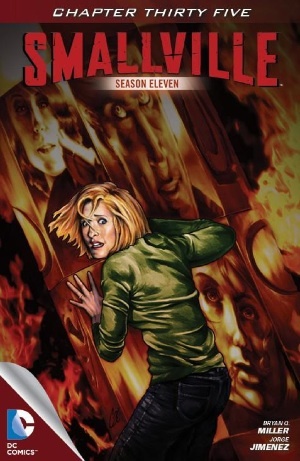 Apparently, Dr. Simon "Psimon" Jones had called Lois to tell her that Tess had asked him not to "dig around" in Lex's mind (see "Haunted" #3), which, because Tess is supposed to be dead, doesn't make much sense to Lois. But Otis says he neither knows Lois nor trusts her, and isn't about to talk. She's not happy about it, but begrudgingly admits defeat and leaves him to his Shirley Temples to go phone Barbara Gordon and ask her to come to Metropolis and try to get the information out of Otis. Barbara is there in a jiffy. Meanwhile, out in Las Vegas, Superman is busy saving citizens affected by the speed storm, the effort charging his new special suit so that he will be able to move fast enough to confront the Racer. When he finally can, the Racer acknowledges his presence and says that while Superman is not "of speed" he will be consumed anyway. They charge each other and bystanders on the outskirts of town are witness to the force of the collision. As is Bart, still at Jay Garrick's house in the Utah desert, who then promptly decides he can no longer let someone else fight his battles and prepares with some stretches to race to Vegas. Before he leaves, Jay tells him he had the same experience as Bart when he got his powers: he woke up and had five names in his head - his own, Barry Allen, Max Mercury, Wally West and Bart. Jay tells him the same thing happened to them all, and that Bart is not alone. In response, Bart says he's always alone but that "the only kind of family" he has needs his help. And off he races toward Vegas, with Jay's well wishes of "godspeed." Story - 4: As tends to be the case with most Superman-action-heavy issues of this book, I enjoyed this issue. With the exception of the fight with Batman, Smallville's action scenes have been consistently fluid and energetic, even if they haven't always emerged organically from the circumstances, such as when Hank Henshaw wakes up with his mind transferred into the robot and turns hostile on Superman for not saving him despite having insisted during the failed Guardian mission that he, Hank, had to stay with the Luthorcorp rocket. Here, Superman is perfectly on point with the "No one else dies today" line while progress through the sequence overall is unambiguous and powerful, the stakes seemingly tectonic in magnitude. My only substantial gripe with this issue involves the introductory sequence. Now, this set of three little scenes is indeed useful, and for a couple of reasons. First, it builds not only Lois's and Barbara's characters but also the world by having a relationship emerge for them out of the shared episode on the Leviathan ship base (rather than, oh, I don't know, nothing, like all the early show freak-of-the-week villains who started out as surprisingly intimate because otherwise unseen people in the lives of the mains). Second, it advances the B-plot in revealing that Dr. Jones (who is serving a much more pivotal role than I had initially anticipated) called Lois and that at least somebody amongst the good guys now has reason to be thinking about Tess as more than just a memory. So far, this is all good stuff. However, for me, the third little scene trips it up, and it ends up extending too long before moving over to Superman for his own uninterrupted scene. Moving the one-page sequence where Barbara has arrived at the bar to, say, right after Superman declares "No one else dies today" would actually have been more effective to achieve what I think was the immediate objective - to show how quickly Barbara was able to make it to Metropolis (i.e., how awesome Batman's tech is, with the "sub-orbital" flight and whatnot). But, really, that's covered by the fact that Otis is still at the bar. In the meantime, it wouldn't have had any impact on the momentum of Superman's scene because the space between him setting out for the final showdown and then talking to himself about it makes for a thoroughly natural pause point. There's also the fact that a short, you know, abeyance would have made it seem less like, say, teleporting, which I would have preferred if for no other reason than that Barbara doesn't seem to be the one who wound up with that TELEPORTATION SUIT that everyone has apparently forgotten about. Finally, the scene between Bart and Jay was touching, if undercut by Bart's "Smell you later," which wasn't even a funny line in the 90s when it was in vogue. I always appreciated Smallville's take on The Flash, but one of these days dude will have to grow up. Won't he? Art - 4: Mostly another winner, with special props for the entire Superman scene, especially the page where in the middle of three panels he's hovering before the group of people he just saved and the one guys is, like, "Are we dead?" Very heavy atmosphere, very appropriate, with the center panel nicely set off in red from the other two in blue. However, I have to say the suit is far too much like the 90s Superman Blue for my taste. Indeed, so clearly is it basically the same suit, I must dole out a knuckle rap for unoriginality and one for the fact that the speed force isn't really an electricity thing (two knuckle raps equal one full point in the Official Superman Homepage Mild-Mannered Reviews Grading System, which I guess at the moment is just me making that up off the top of my head but which, as I think about it, could become real...), even if it does have similar visual properties (i.e. the jaggedness, the crackling), making the decision to ape that design even more puzzling. I mean, man, the 90s were like a lost decade for comic books, and in this issue we have at least two pretty direct throwbacks to that very time. Ick, no?